JACKSONVILLE, Fla.--(BUSINESS WIRE)--Southeastern Grocers, Inc. (SEG), parent company and home of BI-LO, Fresco y Más, Harveys Supermarket and Winn-Dixie grocery stores, received high honors for two yogurt flavors, four frozen yogurt and ice cream flavors and a cheese variety from its SE Grocers private label product line from the Wisconsin Dairy Products Association during the 2018 World Dairy Expo Championship Dairy Product Contest. Six of the seven award-winning SE Grocers products can be purchased at all BI-LO, Fresco y Más, Harveys Supermarket and Winn-Dixie locations throughout the Southeast, with the Vanilla Greek Yogurt available in BI-LO and Winn-Dixie stores. 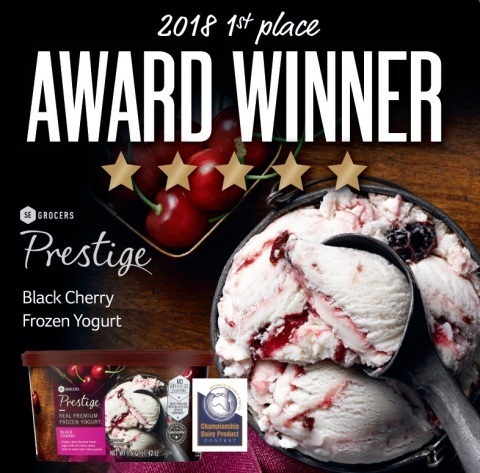 This marks the fourth consecutive year Southeastern Grocers has been recognized by the Wisconsin Dairy Products Association, with top prizes awarded for Raspberry Cone Crunch Ice Cream in 2017, Prestige French Vanilla in 2016 and Prestige Coconut Almond Fudge in 2015. The 2018 World Dairy Expo was held in Madison, Wisconsin on Aug. 21-23, 2018, and serves as a forum for dairy producers, companies, organizations and other dairy enthusiasts to come together to compete, and to exchange ideas, knowledge, technology and commerce.